Recapture your youth by breaking out your favorite mixtapes and transferring them to your iPod, iPad or mobile device! If you grew up listening to your favorite bands on a cassette tape, you know there s nothing quite like the sound of strumming guitars and thumping bass as it poured through the headphones of your shiny new Walkman. 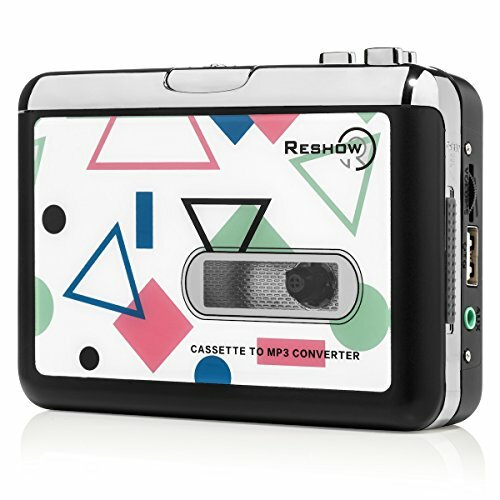 Well now, thanks to the Reshow Cassette Player you can convert all your old tapes and mixtapes to a digital MP3 format so you can listen to them on your new iPod or mobile device. Main Features: USB Transfers Tapes to MP3 USB 2.0 Port VGA Card with 32mb Memory Requires Pentium 4 (1.7 GHz) or Above Material: Plastic / Iron Power Supply: 2 AA Batteries, 3V DC or USB 5V DC Power. Compatible with Microsoft Windows XP, Vista, 2000/7/8/10/; Mac older than version 10.5 (Mac operation requires download of free software) Order Includes: USB Cassette Player Headphones Software CD USB Cable User Manual NOTE: If your laptop or PC doesn't have a CD-ROM, contact us and we'll send you a digital copy. Please refer to the user manual to ensure music optimization. As a reminder, sound quality is highly depended on tape viability. For better sound quality, please avoid signal interference. Battery and tapes are not included WARNING: For your safety, please ensure battery condition is new and good before using. Keep away from fire as the item s main material is plastic. Keep out of reach of children, except under adult supervision. Your youth is calling; pick up our Walkman/USB converter today and enjoy the sounds of the past in glorious clarity. Get yours now by clicking Add to Cart . Portable design fits in virtually any bag and enables you to play and transfer anywhere. Flexible battery or USB-powered operation. Comes with Tape Converter software to guide you through transfer. Battery and tapes are not included. If you laptop or PC doesn't have a CD-ROM, contact us and we'll send you a digital copy. Please refer to the user manual to ensure music optimization, or according the picture to operation. As a reminder, sound quality is highly depended on tape viability. If you have any question about this item, please feel free to contact us, we will try to help. 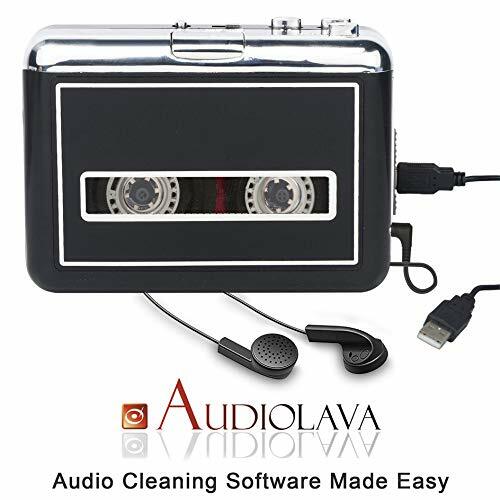 Tape to MP3 USB cassette capture is a small USB tape player that works with all kinds of tapes. Converting the music on your tapes into MP3 files is a new innovation to digital these old tapes in a cheap way. This device also has an easy-to-use USB connection . Portable Size The portable size allows it to fit in virtually any bag and enables you to play and transfer music anywhere. Support 3.5mm AUX jack, you can connect it to your car speaker, speaker, or just connect it with an earphone to listen the music. Compact Design Lightweight and compact. It runs on battery. 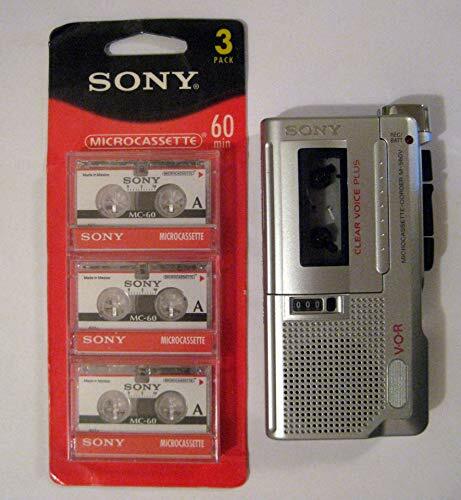 Besides when it connect to USB power or connects to your computer, This cassette will not need a battery, which is easy to use. Software Required Come with software CD to guide you to convert your cassette tapes , Compatible with Windows 2000, XP, Vista 32bit 64bit/Windows 7/ 8/ 10. It is very easy to convert your cassette collection and edit the Audio. Package Included If you laptop or PC doesn't have a CD-ROM, please contact us and we'll send you a digital copy. Package included: 1 x USB Cassette Capture, 1 x USB Cable, 1 x Software CD, 1 x 3.5mm jack earphone, 1 x User Manual ( Cassette tape is NOT included ). 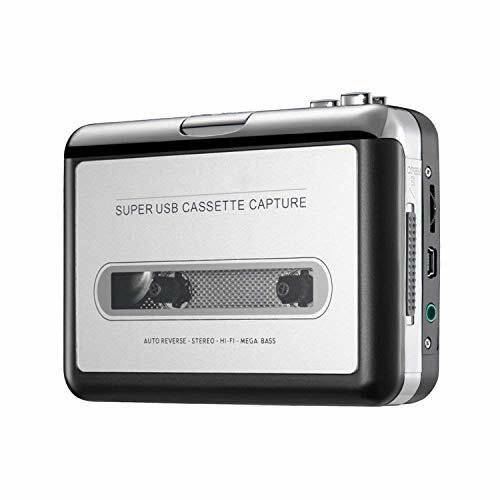 Tape to Digital Files USB cassette capture is a small USB tape player that works with all kinds of tapes. Converting the music on your tapes into MP3 files is a new innovation to digital these old tapes in a cheap way. This device also has an easy-to-use USB connection . Portable Size Stander 3.5 Jack The portable size allows it to fit in virtually any bag and enables you to play and transfer music anywhere. Support 3.5mm AUX jack, you can connect it to your car speaker, speaker, or just connect it with an earphone to listen the music. Compact Design Lightweight and compact. It runs on battery or USB power. Besides when it connect to USB power or connects to your computer, This cassette will not need a battery, which is easy to use. You can use power bank as a battery. Software Required Come with software CD to guide you to convert your cassette tapes , Compatible with all Windows System and Mac OS. It is very easy to convert your cassette collection and edit the Audio. The Perfect Solution for dictation, lectures and journalist interviews. Awaken your memory of the past, awaken the classic music. You just need to plug a USB flash drive to the USB host of the Cassette Player.then press "record" button, the device will convert the tape to your USB flash drive in MP3 format automatically. You can also playback on it to check the converted music files by pressing the playback button of the cassette player. You will be the cassette/tape conversion expert among your friends and families! Support: FAT,FAT32, exFAT format. if you want to edit your recorded MP3 files, you can use a free software-Audacity, download it from:http:audacity.sourceforge.net or contact with us. Converting speed can't be adjusted, which is same as the speed of playing tape. Maximum capacity can not exceed 32GB. Sound quality: It depends on the audio source. If the sound quality of tapes is low, then the Mp3 from converting will not good either. The USB Portable Cassette to MP3 Converter Tape-to-MP3 Player has no built-in speaker. Battery and USB Disk are not included. Walkman Tape Cassettes, Power Supply: 2 AA Battery (Not including)/ 5V DC USB Power. Attention: It records only when the tape be playing. 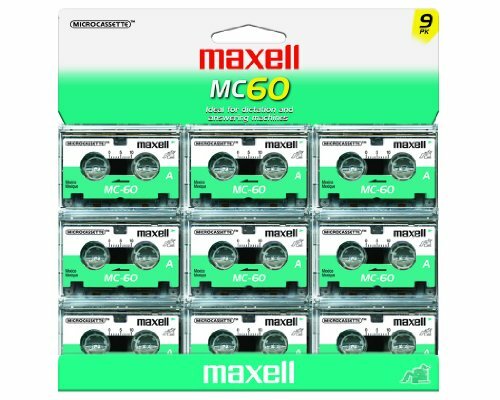 Maxell micorcassettes are the ideal for use in dictation machines or tape recorders that use this format. They offer a perfect range for voice recording and are well suited for lectures and seminars. Each tape will record up to 60 minutes. IT DOES THE JOB AND IT EVEN LOOKS RETRO! Have you been wondering what you're going to do with all those ancient cassettes you still have? 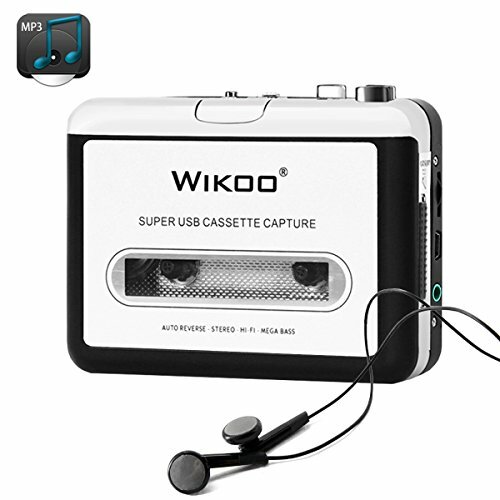 This is a great device to transfer your old cassette tapes into MP3 format. The converter records your tape - either manually or automatically - on a USB flash disc and then can be transferred anywhere. NOW, YOU CAN EASILY BRING YOUR OLD FAVORITES TO LIFE! All you need to do is power the converter using either your power bank, cell phone charger or your laptop and then attach a USB flash disc. While the cassette is playing, press the "record" button to start recording. Press the recording button again to stop recording and save the MP3 file in the USB flash. WHEN THE '90s MEET 2017 IT'S AMAZING! The cassette player is made the same way it used to be, that is the size of a slightly fat Walkman. it does a perfect job as a Walkman, playing the tapes or MP3 of thumb drive without converting. WHAT COULD BE A BETTER GIFT FOR YOUR FRIENDS? 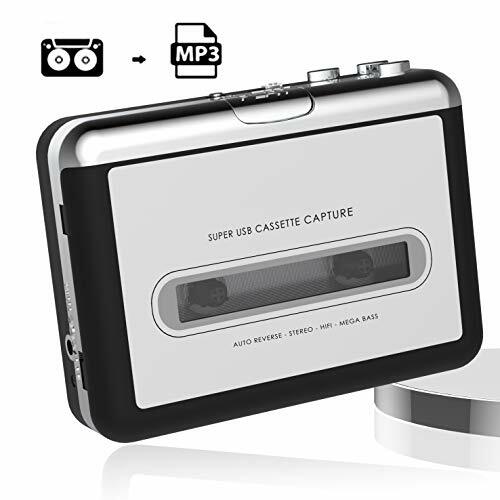 Standalone Cassette / Tape to MP3 Converter is an adorable gift for anyone looking for a simple and effective way of getting those old memories saved onto a durable and a much more accessible format. But it's not only about music. This can also give a new lease of life to your language courses bought on tape many years ago. Product and all accessories are wrapped with individual packaging for extra protection. it's quite nice to look at in a nostalgic sort of way. 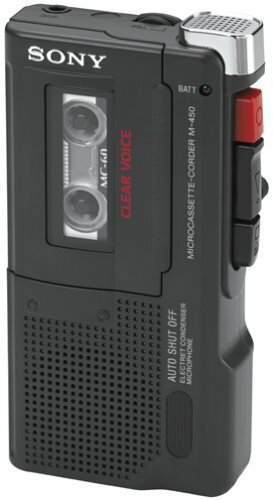 Dictating cassettes are designed for general purpose recording. Product features Rediscover your cassette tapes on the go Convert your mix tapes and cassettes to MP3 to Playback on iPods/MP3 players or burn to CD Portable design fits in virtually any bag and enables you to play and transfer anywhere Plug and Play USB device, no drivers required Flexible battery or USB -powered operation Comes with Tape Converter software to guide you through transfer Audio output enables you to listen on your stereo, Headphones, or other speaker system. Cassette tapes to MP3 Format You might have some beautiful /romantic memories on the old tapes.With Dansrue USB cassette tape player, you can effortlessly record,captures,convert your old cassette tapes to MP3/WAV/WMA files and laptop CD .It works perfectly with Windows 2000, XP, Vista 32bit 64bit/Windows 7/ 8/ 10,Mac OS 9/x to 10.6 user. Easy to Use This cassette converter come with software CD to guide you to convert your cassette tapes.When connected to a computer, it runs on battery or USB power for flexible operation, it works perfectly as a vintage Walkman. 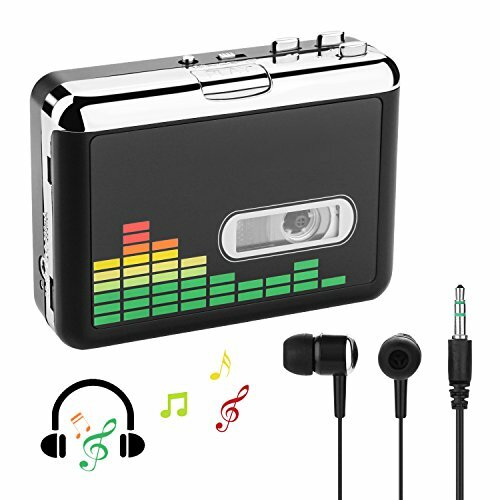 Portable Design for Cassette Player Lightweight and portable design fits in virtually any bag and enables you to play and transfer anywhere.Audio Output enables you to listen to music conveniently whenever and wherever via 3.5mm jack earphone (included). Two Ways to Supply Power This cassette tape player runs on 2*AA battery or USB power when you connect it to your PC for flexible operation , it works perfectly as a vintage Walkman. 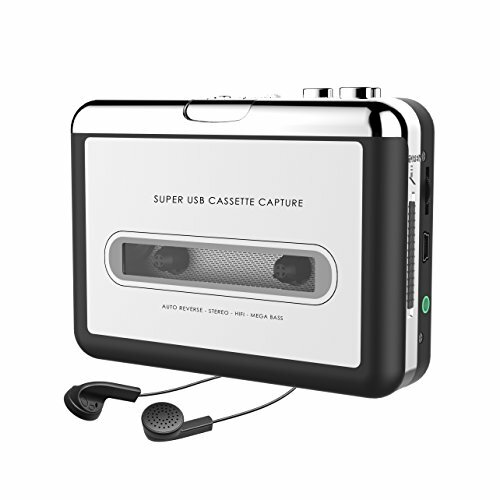 Stylish Appearance Adopted with new metal cassette deck(Mechanism) with automatic Reverse function,more stable quality. 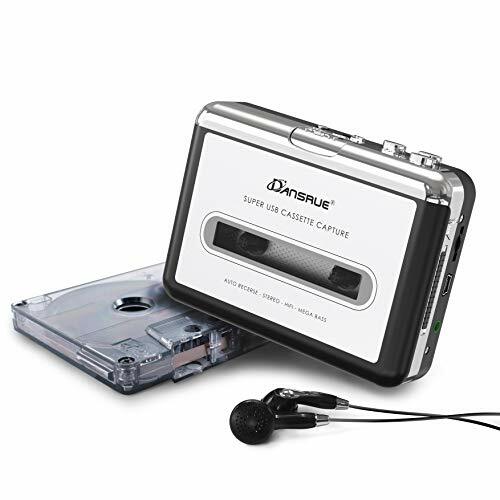 1 x Dansrue Cassette Capture, 1 x USB Cable, 1 x Software CD, 1 x 3.5mm jack earphone, 1 x User Manual.Please contact us if your laptop or PC doesn't have a CD-ROM, we will send you a digital copy and guide you how to operate. 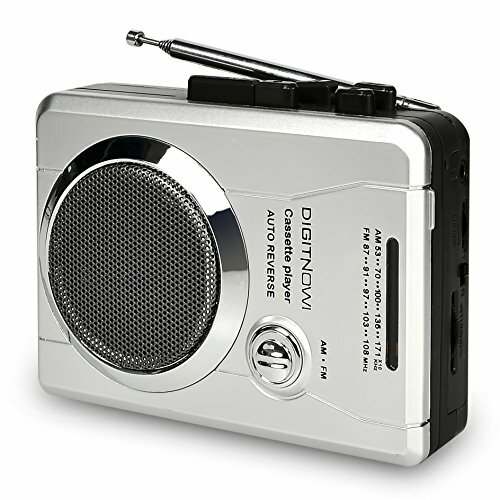 The BR630 is a classic and silver looking FM and AM radio cassette player that also acts as an audio recorder. 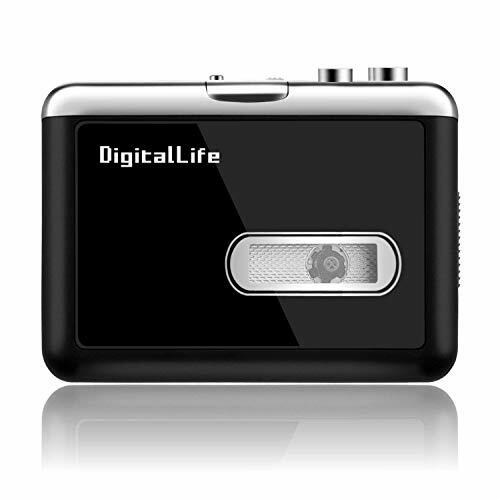 Enjoy your classic music tapes through this Personal Cassette Player from DigitNow. Play loud through the external speaker or listen privately through the earphone. The one touch recording function and auto reverse function provides portability and convenience. Functions: PLAY, STOP,REC,DIR, REVMOOE, FF, REW and Volume adjustment knob,earphone jack FM/AM TUNING on the media player. Eject: Slide this switch to open this cassette holder. Volume: Adjusts the volume of the headphones and USB connection. Player to your computer. For transfering your recordings to your computer, we have provide a software package on the included CD. FF/REW: Press the fast forward or rewind the tape. DIR: Selects the direction of tape playback. This is useful if you want to play the other side of the tape without having to eject it. what the tape dose when it reaches the end of a side. When set to the "loop" icon, the tape will automatically switch direction and begin playing the opposite side when one side has finished . When set to the single arrow icon ,the tape will simple stop when a side has finished. 1. Editing Software: Included . 2. Operating Systems: Windows XP/Vista/7 . 3. Power Source: 2 x AA batteries Not including Or DC adapter Not including . 4. Ports: 3.5mm Earphone, USB port. Portable Design Easy to use Lightweight and compact Walkman. play and transfer your cassette tapes anywhere. The 5-inch software CD is compatible with Apple computers so that can be read by Apple computers also. Personal Cassette Player from DigitNow. Play loud through the external speaker or listen privately through the earphone. The one touch recording function and auto reverse function provides portability and convenience. 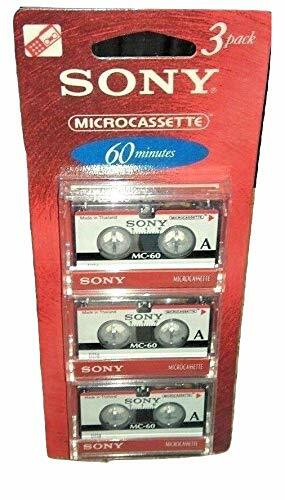 Ideal for playing your old cassette tapes. 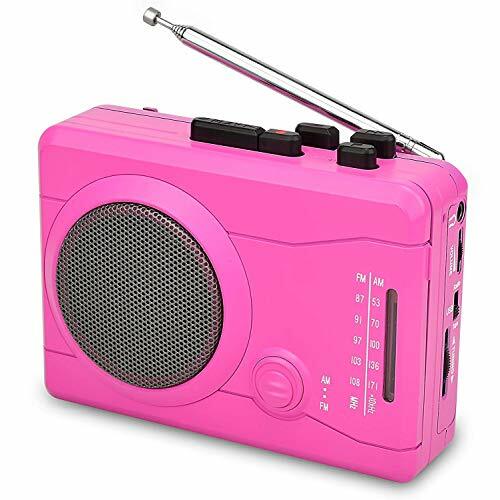 Functions include recording MP3 music of PC or MAC, external voice or the built-in radio into cassette tape, Converting cassette tape into MP3, playing cassette tapes, listening to AM/FM radio. Compact design ts into virtually any bag or large pocket. It is portable with a detachable belt clip. It can be powered from PC via USB cable or powered by 2 x AA batteries(Not included). The earphones supplied can be plugged into the 3.5mm Audio Output port which can also be used to play stereo audio over speakers or over a Hi-Fi system. - Cassette auto reverse function, AM/FM radio on and tuning controls. - USB, Tape or Radio function option. - Integrated speakers and microphone. - Telescopic antenna for improved AM/FM radio reception. 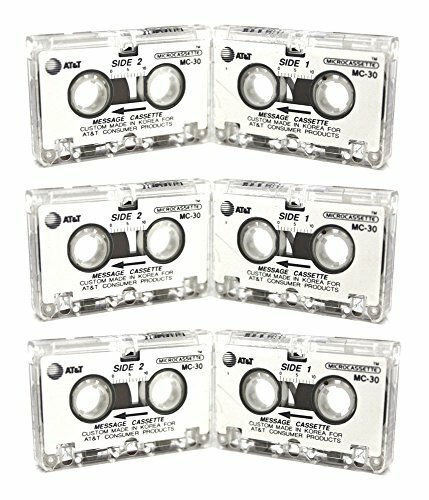 AT&T Brand Microcassette used for the older versions of answering machines. DEEP BASS AND GREAT SOUND QUALITY WITH APTX High-fidelity stereo sound quality with aptx codec and CSR8645 chipset. These headphones are compatible with most smartphones. 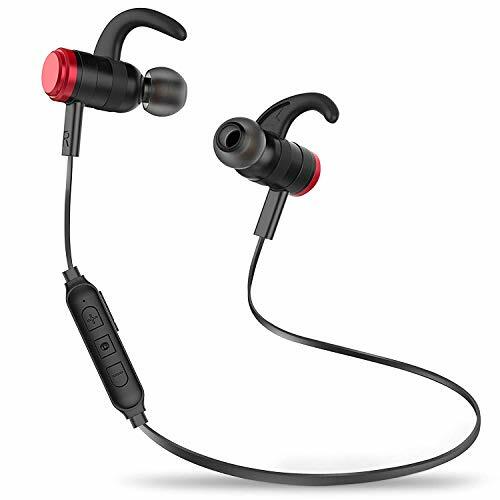 IPX4 WATERPROOF & SWEATPROOF EARPHONES Built for your active lifestyle - these earbuds are rated IPX Level 4 and can withstand dripping sweat. Ergonomic design allows for ultimate wearing comfort to match your active lifestyle like running, jogging, cycling, driving, camping, hiking, gym exercise and other outdoor sports. LONG-LASTING USAGE & BUILT-IN MAGNETIC DESIGN With Advanced Low Consumption CSR chips, this headphone provide up to 5 hours talk time and 6 hours music play time as well as up to 100 hours of standby time and charges in 1-2 hours. Convenient built-in magnets enable you attach the earphone together when you don't need them. And it will present a fashionable sport look as well as avoid cable tangling together. BUILT-IN MIC AND VOLUME CONTROL & 100% SATISFACTION GUARANTEE With volume control panel, it is perfect for answering calls or listening. Your satisfaction is our main priority. If you any questions please feel free to contact us. Three-month no hassle replacement. 1. Battery and tapes are not included. 2. If your laptop or PC doesn't have a CD-ROM, you can download the software online, please contact us,we'd like to send you the direction. Now you can have your old memories revived safely! even though the cassette tape is essential dead, there are still untold millions of tapes sitting in cardboard boxes and cabinets All over the world. many of these tapes contain content you just can t get in digital format. Unique voice recordings, demo tapes, radio broadcasts and more are trapped on magnetic tape and disappear forever when those cassettes are finally thrown out. But there is a way to bring them into the digital era. our cassette to MP3 Converter allows you to recover the audio on your tapes by transferring them onto a flash disc and converting them into a digital format. This is great if you still have your old Cassette collection that you want to resurrect or if you simply want to archive your tapes so you can finally get rid of them. our cassette to MP3 Converter runs on USB power when connected to not just your computer but also your power bank or your cell phone charger for flexible operation. with this cassette tape to MP3 Converter, you can easily convert your old tape to MP3, without a computer. You just need to plug a USB flash disc on and then press the "record" Button. please be informed that headphones are not included in the product. Please be prepared with your own Headphones. Nothing compares with this feeling, these memories from these years of Youth that rise up when you press the play button! Your favorite cassettes, these mixed tapes that bring you back in time, have a great mental value for you. This unique tape to MP3 Converter works as a Walkman and you can to listen to your vintage music but it also allows you to convert & save it in a more secure way, by turning these songs to MP3 format. The aux jack enables listening with your earphones or your stereo for a vintage music experience and it is compatible with your PC s operating system. This is a great gift idea for everyone You know that lived his Youth during the 70 s or the 80 s. Give them a chance to save and preserve their music in the modern age. It is lightweight and its fitting size makes it 100% Portable to have it with you wherever you go. Enjoy your favorite music anywhere you like. Product features MP3 format converter power supply by batteries or via USB port PC operation system compatible with every order you shall receive: user instructions USB cable if any issue occurs regarding our product don't hesitate to contact us! Order & get your reshows cassette player & MP3 Converter by clicking the "add to cart" Button now! . --Tape Player Captures,awaken your memory of the past, awaken the classic music. 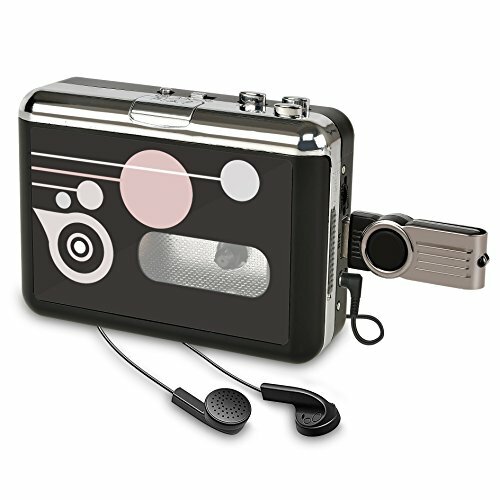 The V.TOP USB Cassette Player is a portable, handheld USB tape player that works with all kinds of tapes. 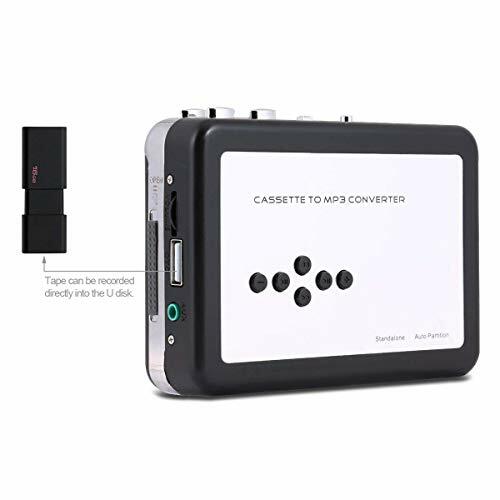 It has an easy-to-use USB connection for converting the music on your tapes into MP3 files.Now It's time to dust off that cassette deck and turn those precious cassette tapes into Digital MP3s with the Standalone Cassette to MP3 Converter. It's just 2 steps. Load the Cassette and Push the Record button.The Cassette To MP3 Converter digitizes old cassettes so you can enjoy them again on your computer,smartphone or MP3 player. Simply install the free Audacity software on your PC or Mac. Then connect the Converter to your computer with the included USB cable. Press play on the device and record on your computer to make a real-time digital copy. Rediscover those old songs with USB Cassette Player by turning your tapes into MP3's to use on your computer, iPod or in the car! 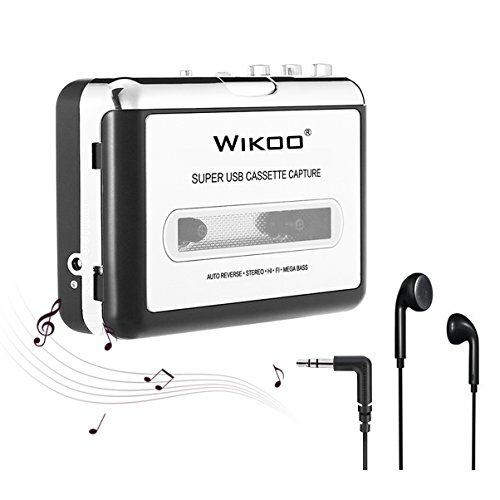 In addition to transfering your tapes, USB Cassette Player has an audio output that enables you to listen on your stereo, headphones, or other speaker systems for hours of enjoyment! 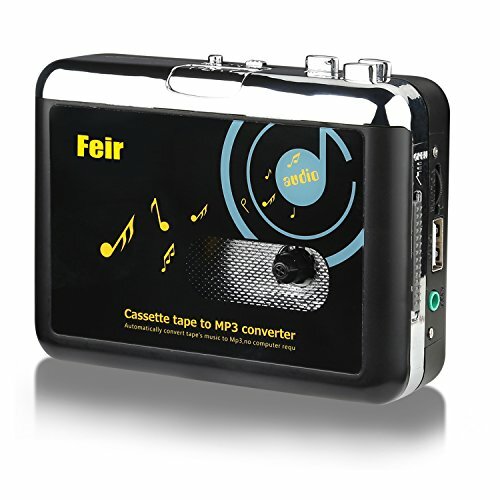 This USB Cassette to MP3 Converter is easy to convert the music on your tapes into MP3 files. You can listen to MP3's on your computer, load them onto your portable music player, or record them onto a CD and listen in your car. 2. Batteries and tapes are not included. 3. If your laptop or PC doesn't have a CD-ROM, you can download "Audacity" online, please contact us, we'd like to send you the directions. Convert Tape to MP3 Rediscover old songs with this USB Cassette Converter. Convert old mix tapes and cassette to MP3 or burn to CD. Works perfectly with your personal computer or laptop. Tape Player It is a portable, handheld USB tape player too. AA battery/USB-powered operation. Audio output enables you to listen on your headphones, or other speaker system. Easy to use Plug and Play USB device, no drivers required. Comes with easy-to-use software and manual guide you through transferring your Music. Compatible with Windows 2000/XP/Vista/7/10 & Mac. Portable Design Portable design fits in virtually any bag and enables you to play and transfer anywhere. It also can works as walkman with batteries. Software Comes with audio editing software Audacity. It is very easy to convert your cassette collection and edit the audio.